Timelapse video 'Ginkgoblätter öffnen sich' (unfolding Ginkgo leaves). In this video the poem "Ginkgo biloba" (1815) by Johann Wolfgang von Goethe is cited. During the months following pollination, the Ginkgo pollen grows big enough to form two motile sperms in the pollen chamber. Read more on my Propagation-page and click here for schemes, photos and videos of the ovule development. 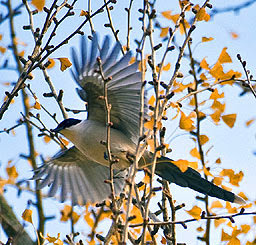 Azure-winged magpie with autumn Ginkgo. Video of an old Ginkgo tree on a playground in Toyokawa city, Aichi prefecture, Japan. The tree is 25 m in height, girth c. 4.3 m.
Japanese television video on YouTube.